Passover is this month and I, like millions of Jews worldwide, will clear my house of every last bread crumb and gather with friends and family to retell the ancient story of the Hebrew’s liberation from slavery in Egypt. Pesach, as it is also known, is one of my favorite celebrations. I love the abundance of quirky symbols and traditions that have been picked up over thousands of years, not to mention it is mandated that everyone drink four glasses of wine. On the first night it’s tradition to share a feast of mostly edible food, called a Seder. Most often, a Seder table consists of six or seven separate items, each a representation of part of the Passover story. While it’s not uncommon for there to be lively debate over the true symbolic meaning of each component, a few years ago I grew curious about one in particular: the matzah. This is a perfectly valid explanation, brimming with imagery of a people rushing for their chance to escape oppression. But, as I learned, it turns out there are also practical explanations, that much to my delight have to do with the biology of fungi. Passover is the first of three annual harvest festivals, during which the ancient Israelites would all travel to Jerusalem (Shavuot and Sukkot being the second and third). Pesach celebrates the first harvest of barley, and prior to their first haul, farmers and shop keepers would sweep out the previous year’s remaining grain. But along with all that old grain went something else: yeast. Yeast is a fungus, just not the type that forms mushrooms, like those housed in the Sam Mitchel Herbarium of Fungi. 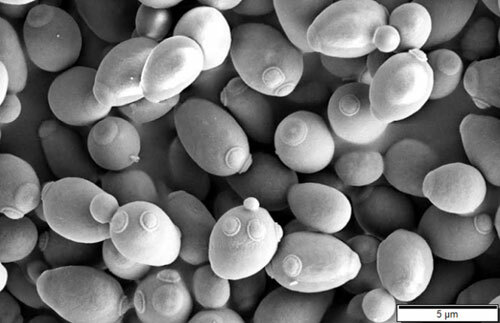 Strains of the microscopic organism Saccharomyces cerevisiae hang out on fruits and grains, feeding on their sugars, a process known as fermentation. Without plentiful yeast floating around, the first batches of bread made from freshly harvested barley wouldn’t rise, thus resulting in a flat unleavened loaf. Over time practices have changed, new traditions and rules have taken hold. Matzah is mostly mass produced and made from wheat, rather than barley. The first harvest festival eventually became the time to reflect on freedom and how the Jewish people have overcome so much. But whenever I crunch into a piece of matzah, I am humbled and reminded by how much of impact an invisible fungus can have on our culture and customs.